George Palmer has recently travelled to Japan to meet companies that we own and many that we don't. Due to some odd airline scheduling it is difficult to sleep on the way to Tokyo which makes the 7AM arrival and a full day of meetings more of a challenge. The most recent occasion had an extra frisson as I turned my phone on to the news item – North Korea ballistic missile currently flying over Japan. Not even concerns about nuclear war starting less than 800 miles away can halt the jetlag of that flight however. We had around 200 meetings with Japanese companies last year which means that we have a reasonable feel on things that change (whether rapidly or gradually) and things that don’t. Profitability – the stereotype goes that Japanese companies are largely less profitable than if the company were run by European, American or even other Asian leaders. The pursuit of perfection produces products that don’t sufficiently cover their development costs; over commitment of capital makes poor supply and demand dynamics and socialisation of the welfare state creates management culture that is flabby and bureaucratic rather than lean and focused. Whilst to the historical realist this is a structural problem, to the Japan optimist this creates an opportunity. It is therefore particularly heartening to hear more and more companies say things like “we don’t think that it is an attractive market for us” or “this is a big opportunity for us with our existing cost base” or “by reorganising the way we do this business and avoiding duplication of effort we can generate incremental revenue and significant cost savings”. It is not occurring in every company and in some companies one suspects that it is little more than lip service, but for those that are genuine and follow through with it then the stock returns could be significant. Wage inflation – we have written before about how stubbornly low wage inflation is in Japan in spite of unemployment being below 3%. There are myriad possible reasons for this – including an expanding male and female labour force, slightly increased influx of foreign workers and the use of automation to increase productivity – but the facts still fly in the face of (largely) accepted economic theory. When you ask companies about how they are dealing with this then the answer is either about reducing the need for labour or by enhancing the attractiveness of a role through benefits ancillary to salary. For the first time a company replied “by paying staff more” – but it was still number 4 on the list and one swallow doesn’t make a summer. Automation – this is a theme that is recurring and with an ever louder voice. It manifests itself in the replacement of human labour for simple tasks but is also penetrating wider and wider business areas. Reference to industrial robots normally summons up images of the production lines of car makers but smaller robots are being used in logistics, retail and healthcare to name a few. It is a rapidly changing area with any related stock’s performance seemingly strapped to a rocket. It requires a huge amount of deep thought to understand the impact on every part of every business – and what effect that opportunity/risk has on the value of a company. Infrastructure – as Japan recovered after the Second World War and built towards its first summer Olympics in 1964, its infrastructure was constructed at a furious pace. Another peak occurred after the economic bubble burst at the end of the 80s, with the government trying to keep things going through public spending. A lot of this infrastructure is now very old and in need of enhancement or replacement, a problem exacerbated by the reduction in spending in the aftermath of the global financial crisis. This need is starting to be met and it comes at a time of additional spending on the next Olympics in 2020, airport expansion to accommodate more tourists and magnetic levitation rail projects that tunnel straight through the Japanese Alps. The total annual spend is high and potentially staying like that for some time. Optimism – many global investors and much of the world’s media approach Japan as if the world’s second largest equity market can be solved with the answer to one question – “has Abenomics failed?” Without delving into why this is a poor question and the answer unlikely ever to be binary, it does imply another important question – are the Japanese more optimistic and is deflation ever likely to be beaten? The deflationary mind-set arguably started to seep into national consciousness in the early 90s and thus it has been the status quo for more than 20 years. Today’s graduates do not know any price reaction other than down. Even if you assume that Abenomics has and will continue to be a riotous success, it will take some years (or a shorter burst of hyperinflation) yet to change the foundation of a two decade national frame of mind. Whilst the presence of Abenomics doesn’t mean that rampant optimism has returned, the continued absence of US style “animal spirits” does not mean that things are not improving. At Waverton we are trying to buy the best companies in the world, with great sustainable competitive advantages, value enhancing management teams and strategies and strong cash flow growth. We want to buy them when they are attractively valued relative to their global peers, their own history and their opportunity set. Understandably this means that our search for companies is driven from the bottom up by the fundamentals which is why you will rarely hear one of us say that we are very positive on a certain region solely from a macro point of view. Most global investors focus their decisions on when to buy or sell Japan as a market, and when to hedge their yen exposure (both of which they are – as a class – hideously bad at). Instead we have found the archipelago to be a rich hunting ground for world class companies that trade under a Japan discount. Indeed, anecdotally, when we review our regional preferred stock lists, Japan is almost unique in that the final line of any investment case is “and it’s cheap” (rather than “reasonably priced” or “really quite expensive”). 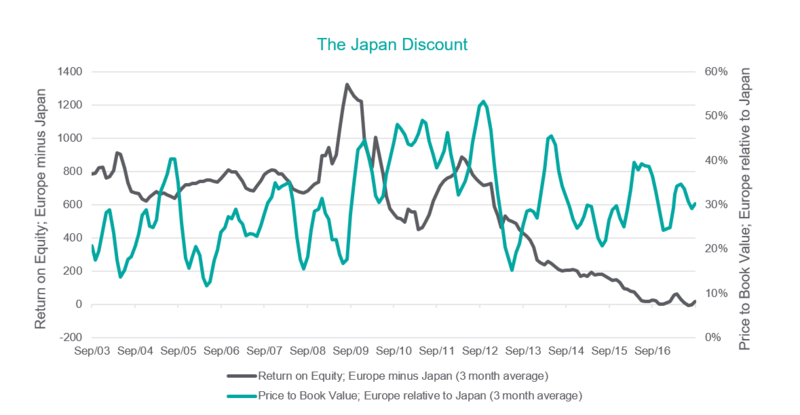 The Japan discount has been highly deserved in the 21st century – low profitability businesses, little care for foreign/minority shareholders or sign of change and inefficient balance sheets have led to very low returns on shareholders equity. Europe, for example, has made a much higher return and was therefore justified in being valued at a much higher multiple of that equity. As can be seen in the chart below, up until 2012, Europe’s premium return to Japan (the black line) led to the multiple premium (the green line). What is interesting now is that Europe no longer has a premium return-on-equity to Japan (the black line has fallen to almost zero) but the price-to-book value premium (the green line) has remained in place. This is unsustainable in the long term. If returns rise at Japanese companies that do focus on profitability, operating effectiveness and capital efficiency then this would look even more irrational. In the meantime this phenomenon allows us to carry on building cheap positions in those companies that can improve and dominate the world in their sphere.